Water games help children lose their fear of water while underscoring the connection between swimming and fun. Most of them work nicely with six or more participants, but you can make them suit the number, ages and skill levels of your family. Remember - an adult can quickly come down to a child's level by swimming one-armed, and a child's speed can be boosted with a pair of fins. As you play, remember the faster the pace, the more the game will hold the childrens' interest. Another trick is to vary the games so that everyone can do something well. Always maintain a high adult-to-child ratio, taking as a basic rule of thumb that the younger the children, the more adult supervisors you need. To keep the games safe, minimise diving and jumping into the pool by keeping the games in the water. This is a relay race that needs 2 teams with an equal amount of players. You also need enough water balloons so that there is one for each player and a few extra for mistakes. Make start and finish lines about 6 metres apart on the side of the pool. Place the water balloons in two piles at the starting line. Call out "go" and the first person on each team picks up their balloon and runs to the finish line. There, they must sit on their balloon and pop it and then run back to the start line. Then the next player grabs their balloon and does the same thing. If a player drops their balloon, or pops it on the way, they must go back to the start line and take a new balloon and start again. The first team to finish popping all of their balloons is the winning team. Have two groups: one for the cannonballs and the other group a team of judges. The cannonball group line up behind a diving board and have to make the biggest splash to get the highest vote. The judges are the voters and give each person a vote out of ten. An adult is needed to collate an overall score and make sure the judging process is fair. Two teams form separate lines in the deep end of the pool, with the strongest swimmers in lead positions. Each swimmer holds onto the ankle of their teammate ahead with one hand, leaving his other arm free for a modified sidestroke. At the whistle, the two "centipedes" wriggle to the other end of the pool and back, with each swimmer tagging the far wall with their free foot. If anyone's hand slips, the rest of the centipede has to wait until the link is re-established. Assemble two teams, one offensive and one defensive, at opposite sides of the shallow end, plus a referee with a watch on the deck. Armed with soft rubber balls or small beach balls, the offensive team tries to hit the defensive players. An offensive team member can retrieve balls, but he must return to the starting position before throwing again. Defensive players must get out of the pool when hit. After all have been hit, the referee notes the elapsed time, and the teams change roles. The team that stays in the water the longest before being wiped out is the winner. Gather players in the shallow end. Define the boundaries of play so that everyone can stand up (Adults, on your knees!). One person is "it." "It" has one minute to tag as many other players as they can. Once tagged, a player must stand frozen and raise their hand. Before a frozen player can return to action, an unfrozen player must "thaw" them out by submerging and swimming through their legs. A player cannot be tagged and frozen if they are underwater. The "Killer Whale" stands outside the pool. Everyone else jumps in and can swim to any location but must stay a metre away from the sides. The Killer Whale jumps in and swims around leisurely until the referee yells, Killer Whale. At this moment everyone must swim to the sides for safety. Anyone touching the sides cannot be tagged. Anyone tagged by the Killer Whale becomes the Killer Whale for a new game. At least 3 people are needed. Whoever is chosen to be 'Marco' has to close his/her eyes (cover with hands) and count aloud to 10. Marco must then begin to search for players keeping their eyes tightly closed. Whenever Marco calls out "Marco" all other players must instantly reply "Polo". Marco must try and tag someone who then becomes the new Marco. Get players to partner up. Players try and swim in pairs with one half doing the arm movements while the other half of the pair holds onto their partners legs and does the kicking movement. Best tried in the shallow end. Strew a variety of stuff at the bottom of the pool: dive rings, spoons, coins; anything that doesn't float, isn't made of glass and has no sharp edges. Make sure there are two of everything (one for each team). Designate the shallow end for little children, the deep end for bigger ones and grown-ups and give each team a list of items to retrieve. The team that collects the most things on its list in the allotted time wins; the other team has to scour the pool for the remaining stuff. Two teams, the Sharks and the Jets, line up opposite one another in the middle of the shallow end, with 5 feet of open water between them. A referee on the side blows the whistle and yells, "Sharks!" or "Jets!" That team must turn and sprint toward its side of the pool, with the other team in hot pursuit. A player tagged by a pursuing Shark or Jet joins the other team. The referee can let the chase continue all the way to the end of the pool or he can sound the whistle anytime, shout out the other team's name, and turn the pursuers into the pursued. 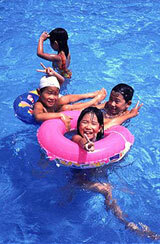 This swimming pool game is fun for a large group of children to play. One person is chosen to be the "Shark" and starts in the middle of the pool. All the other players are "Minnows" and start out of the water on one side of the pool. The Shark calls out "Minnows", and the Minnows jump or dive into the water and try to swim to the other side without being tagged by the Shark before they get out of the water again. If they are tagged, they become a Shark and stay in the water. The Sharks call out "Minnows", and the game is played again until there is only one Minnow left. This Minnow is the winner and starts as the Shark in the next game. You will need a minimum of four people to play this game. Two children grab the ends of the towels and the other team does the same. Put a water filled balloon in the middle of the towel on both teams and the teams have to throw the balloons with the towel and catch it with the towel. The first team who drops the balloon and it bursts loses. Line up beside a length of a pool, (25m is ideal). One by one each swimmer must go as far as possible underwater, until they come up for air. Once they surface, have them sit on the pool deck, beside the place where they came up. The person with the biggest distance gets a prize. Position two targets at either end of the pool. (or proper goals if they happen to be handy). Once a player holds the ball they cannot move, either they must try to score a goal or throw the ball to another player. All other players are free to move, but must remain in the water (including goalkeepers). Play is continuous. Except if the ball goes onto the poolside where it is handed to the nearest 'goalkeeper' as a goal throw. Once a goal is scored the ball is given to the referee to be thrown into the middle as a `toss up' between teams, or it can be given to the goal keeper of the side the goal was against. Divide into two teams. Give each team the same amount of water balloons and water soaked sponges. Designate a race destination. The two teams start in separate locations and try and make it to the destination without being hit whilst at the same trying to prevent members of the other team making it by hitting them. If anyone is hit with a water object they become Out. The team with the most players at the final destination wins. Divide into two teams and half of each team goes to the opposite side of the pool. The first player in line on each team is handed a large soaking wet t-shirt. The player must put the shirt on completely before jumping into the pool and swimming a length. Upon arrival, the swimmer must remove the t-shirt and hand it to the next player who must put it on and swim back. The game continues until one team completes the relay. This game is fun for all ages. At the 1932 Los Angeles Olympics, the Japanese team won all the men's swimming titles except the 400 metre freestyle which was won by Buster Crabbe. Buster Crabbe, gold and bronze medallist in the 1932 Olympics, went on after his swimming career to appear in 175 movies. He signed with Paramount for his first film "King of The Jungle" in hopes of becoming a rival to Johnny Weissmuller in the movie industry. Weissmuller was a swimming Olympian who starred in 12 Tarzan pictures. A blue whale's belly button is about 8 inches wide. Captain Matthew Webb of England was the first to swim the English Channel using the breaststroke. Captain Matthew Webb was also the first man to swim the English Channel without a life jacket. Captin Webb later died trying to swim the rapids above Niagara Falls. Gertrude Ederle was still a teenager when she became the first woman to swim the English Channel on August 6, 1926. Not only did she swim the channel, but she also broke the speed record previously held by a man. At the second modern Olympic Games contested in Paris in 1900, the most unusual event to be held was underwater swimming. It was decided prior to the competition that two points would be awarded for each metre swum underwater. In addition, one point was added to the scoring of each individual for every second they stayed below the surface. Much to the delight of the locals, Frenchman Charles de Venderville won the event swimming 60 metres and staying submerged for 1min 8.4sec. Denmark's Peder Lykkeberg stayed underwater for a longer period, one and a half minutes, but only managed to travel 28.5 metres. This was the first and only time underwater swimming was held at the Olympic Games. Right now as you sit reading this, more than 100,000,000 micro creatures are swimming, feeding, reproducing, and depositing waste inside the area behind your lips. The average human produces 24,000 litres of spit in a lifetime, enough to fill two swimming pools. Some hotels in Las Vegas have gambling tables floating in their swimming pools. Pianist Yanni was formally a member of the Greek National Swimming Team. The first woman to break the 1 minute barrier in the 100 yards freestyle was Helene Madison of Seattle in 1932. Don Schollander was the first person to break two minutes in the 200m freestyle in 1963 with a 1:58.4. In 1924, Sybil Bauer became the first woman to break an existing men's record, when she won the 200 metre backstroke at the Olympic Games. In some volcanic areas such as Iceland, the temperature beneath the earths surface rises as high as 360 degrees celcius. Engineers can tap the geothermal energy by piping hot water from underground to warm nearby homes, offices and factories. An outdoor swimming pool in the Icelandic capital of Reykjavik is heated so effectively by this method that it remains open and in use all year round. Divers in the 1300's made goggles from polished, clear tortoise shell. The first rubber goggles, which had heavy glass lenses, were invented in the 1930's. On average, sardines live to be 14 years old. At the 1972 Olympic Games, Steve Genter suffered a collapsed lung only days before his event. Swimming without the consent of his doctors he went on to claim silver in the 200 metre freestyle and a bronze in the 400 metre freestyle. Australian swimmer Dawn Fraser startled the Japanese at Tokyo when she climbed the flagpole at the emperor's palace to take the flag as a souvenir! She paid a heavy price for this misdemeanour as she was banned from swimming for 10 years. The ban was later reduced to four years. Plunge for Distance was a short-lived Olympic event. Contestants began with a standing dive into a swimming pool where they remained motionless for 60 seconds or until they ran out of breath. The length of their dive was then measured. The event was introduced at the St Louis Games of 1904 and the gold medal went to William Dickey of the United States with a modest plunge of 19.05 metres.